New Zealand has just passed half a century of rodent eradications on islands. Confirmation of the first rat eradication in New Zealand on Maria Island/Ruapuke coincided with the devastating rat invasion on Big South Cape Island/Taukihepa. 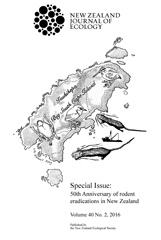 We review the early history of rodent management in New Zealand leading up to and including the Big South Cape Island/Taukihepa ship rat invasion, and document the development and implementation of rodent eradication technologies on New Zealand islands up to the present day. In the last decade major advances have been made in multi-species eradications including rodents, community engagement, mouse eradication, transferring techniques to mainland eco-sanctuaries, and developing new tools for rodent management. The challenge of rodent biosecurity to prevent reinvasion which loomed large only a decade ago, is now being addressed through a combination of research and robust management procedures. Increased emphasis is now being placed on documenting species and ecosystem recoveries following rodent eradication. We identify the major challenges to further expansion of rodent eradication throughout New Zealand as working with multiple stakeholders on inhabited islands, efficiencies of scale on very large islands, and the implementation of cost-effective barrier technologies on the New Zealand ‘mainland’.